Located on the east coast of Central America, bordering Mexico and Guatemala, and with shorelines lovingly lapped by the warm, gentle waves of the Caribbean Sea, Belize is a world-class destination for romance. Tropical sunshine, beautiful Caribbean beaches, cultural antiquity, intrepid adventure, breath-taking biodiversity and the second largest barrier reef in the world make Belize an extraordinarily unique destination, which despite being the only English speaking country in Central America is still largely undiscovered by European tourists – further still increasing its romantic desirability. So if you are looking for a laid-back beach getaway, romantic honeymoon hideaway, an anniversary adventure or a tropical barefoot wedding – Belize is a destination that demands your attention! 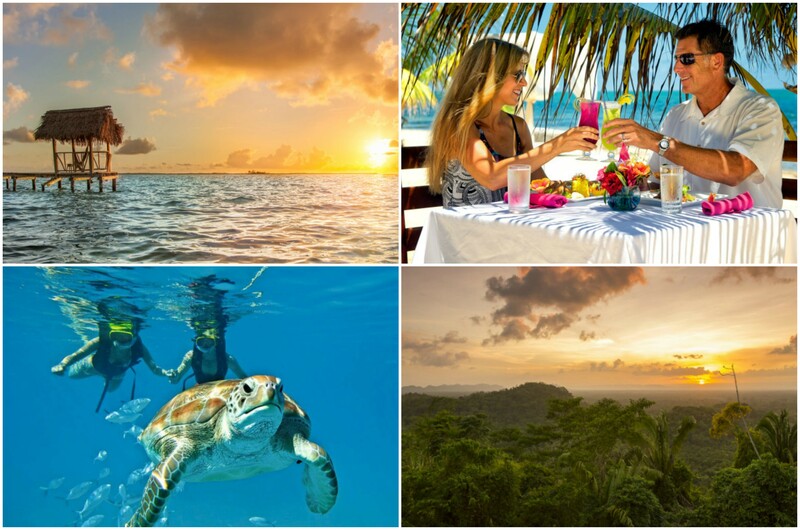 What type of couples enjoy Belize? Around half of Belize is covered with dense jungle and it is a major destination for ecotourism, making it a strong choice for couples with an interest in wildlife and nature, or those seeking a romantic rainforest retreat. However Belize’s biggest romantic USP is that it has something for everyone including luxury Caribbean beach resorts, cultural tours of the ancient Mayan ruins, diving adventures through the coral reefs and hundreds of tiny tropical off-shore islands (called Cayes): all of which can be experienced in a single trip - as and how you wish. The perfect romantic adventure! Starting in late November and running through to April, the dry season in Belize is the most popular time for most tourists to visit. Clear skies, lower humidity and warm sunshine make this a great time for both beach and rainforest stays. Alternatively, for couples travelling to Belize especially for the diving it is recommended to visit during the Summer months instead when the waters are calmer – and the rates are a little cheaper as well. Including beach and rainforest locations our recommended romantic hotels and resorts in Belize offer exceptional romantic experiences and hospitality for couples. PRIVATE ISLAND The perfect place to spend quality time on a private island together. Stay in a bungalow over the Caribbean sea and start adventuring together as a couple. Lay in your personal hammock as the ocean breeze keeps you cool. Experience a new culture in Belize as you start a new journey together. OVERWATER BUNGALOWS Stay in an overwater bungalow with handmade furniture crafted from driftwood and shells with a private balcony over the Caribbean sea. ROMANTIC DESTINATION DINING Book a private dinner for two in the honeymoon palapa or go on a private star gazing boat ride tour. The stars are amazing and will literally take your breath away! BELIZE BARRIER REEF Take a snorkelling trip to the Belize Barrier Reef nearby – the No. 1 must-do activity for couples to enjoy together during their stay. ROMANTIC WELCOME Enjoy VIP treatment with premium champagne upon arrival, floral turndown service, private dinner for two with your own personal waiter in a private palapa over the water, couples gift basket and private breakfast. BEACHFRONT RESORT This romantic, beachfront resort makes every couple feel as special as they did on their wedding day itself. Enjoy a tropical paradise complete with pristine Caribbean beaches, spacious swimming pool, luxury service, great food and indulgent spa. ROMANTIC OCEANFRONT SUITES When staying in the Oceanfront Suites, the water’s edge is just steps away, each suite has a perfect view along with a spacious en-suite bathroom and whirlpool tub. Each suite has plenty of room and privacy to always keep the romantic spark alive. ROMANTIC TREATS Indulge in iced Champagne and decadent treats upon arrival. Follow with a couples massage, body scrub or mani/pedi for two in the newly renovated over-the-water luxurious spa and relax together on a beach-bed for a day with waiter service, champagne and chilled fruit. PRIVATE ISLAND EXPERIENCE FOR TWO Take a romantic trip for two to Ranguana Caye. This nearby private island is the ultimate romantic playground and offers an idyllic 2 acres of sun, sea and virgin sands. Cruise out to the island for a romantic desert island experience where you can snorkel, kayak, swing in a hammock, soak up the rays and enjoy as you please. Bully’s Beach Bar will play music and serve drinks throughout yout trip which also includes a romantic beach BBQ for two. SUNSET DINNER Share a private sunset dinner with a bottle of wine on Shore House boardwalk or with your toes in the sand beachside - a great way to enjoy a romantic Belizean dinner. BOUTIQUE RAINFOREST HIDEAWAY Mariposa Jungle Lodge is a boutique, luxury resort located in San Antonio, Cayo. This is a magical destination for honeymooners or romantic tourists who want "Adventure by Day and Comfort by Night" and who appreciate personalised but unobtrusive service. ROMANTIC CABANA WITH OUTDOOR SHOWER The most romantic cabana is Jaguar, the Deluxe Honeymoon Suite with double hammock in screened porch and additional outdoor shower open to the privacy of the jungle. DAYTIME ADVENTURES Discover the beauty of Belize’s rainforests with daily fun activities including river tubing, zip lining and horse back riding. SLEEP UNDER THE STARS Experience the sounds and wonders of the rainforest at night as you sleep under the stars with a night in the jungle birdwatch tower – not for the faint hearted but a memory neither of your will ever forget if you’re brave enough. TRADITIONAL BEACH HOUSES A choice of traditional beachfront or sea view beach houses set the mood for a romantic getaway in Belize. The property has two pools, a private beach and a restaurant. Hopkins bay is in a quiet location, perfect for couples to wanting to relax in the romantic setting, but also right next to adventure – so you get the best of both worlds. ONE BEDROOM BEACHFRONT LOFT The most romantic accommodation at Hopkins Bay is the 1 bedroom beachfront loft; wake up in the morning and walk out on one of two personal balconies and see nothing but the Caribbean sea. ROMANTIC INDULGENCES Surprise your loved one with a couple’s gift basket in your room. Get a couple’s massage on the beach to start or end your day. Have a private dinner on the beach or on your private balcony with champagne and candles. ISLAND EXCURSION Take an island excursion out to Thatch Caye were you get to spend the day kayaking, paddle boarding, or snorkelling with your loved one. You will also find an over-the-water bar for your tropical cocktail fix. GLOW IN THE DARK LAGOON Witness the once-in-a-lifetime beauty of Belize’s rare bioluminescent bays with an overnight trip to Anderson Lagoon. AWARD WINNING LUXURY RESORT Chabil Mar is an award winning, 10 consecutive year, Belize luxury resort, specialising in romance, destination wedding, honeymoons and anniversary celebrations. ROMANCE AND ADVENTURE From endless sea adventures nestled among the world's second largest barrier reef and islands, to mystic rainforests and the ancient culture of the Maya, Belize is the ideal romance and adventure combination destination for the active couple. ROMANTIC DINING Share a intimate romantic dinners on your personal verandas of a beach-front Caribbean Villa, on the pier or on the beach dining under the stars. Couples may also book island excursions and private chefs are always available at Chabil Mar. RAINFOREST CANOPY Wake up to life inspiring views of the Belizean rainforest canopy and experience a stay of complete luxury in one of the most amazing locations in the world where sea, rainforest and mountains create the ultimate romantic destination. BE EXCLUSIVE Hosting a maximum of 35 guests the award winning Belcampo Belize is an exclusive rainforest retreat of the highest standards. RAINFOREST WEDDINGS Get married in the jungle for a truly unique and unforgettable wedding in Belize.